Flipping through their most recent catalog, however, I saw a set of glasses that I loved. 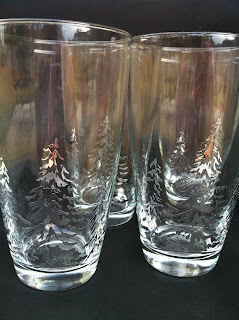 They had beautiful pine trees etched into the side and just screamed "Christmas". Price for a set of 4? Hold on to your socks... $69.95. WOW. I had a quick thought, though. Those pretty glasses didn't look so hard to make. I had all the stuff to recreate it. Just had to do it. In the end, I'm thrilled with how they turned out. The glass on the left is from Williams Sonoma and a set of four sell for $69.95. The one on the right is my recreation, and a set of four cost me a measly $4. SCORE! To get the artwork, I uploaded the .jpg image of the Williams Sonoma glasses into the Silhouette software and used the trace feature to select and trace the trees. I don't have a specific formula or set of rules for this, I just mess with it until it "feels" right. Once I had a good trace, I deleted all of the super tiny dots that wouldn't be easy to vinyl on, enlarged the middle tree, and played with the sizing and placement of the other trees until I was satisfied. I then replicated it to have four... one for each glass. After that, it was just a matter of sending it to the Silhouette to cut. I used a blade setting of 2 and lowered the speed by one (down to 8, I believe... whatever is one less than the normal vinyl setting) because the cut is very detailed. When the Silhouette was finished cutting, I weeded out the part of the vinyl that I didn't want to adhere to the glass. Applied transfer tape, and then transferred it to the glass. Peeled back the tape... and had my new Christmas-y set of glasses! T-shirt FAIL... plus "More Cowbell".